>>”27 June to 7 July 1227 B.C.E. 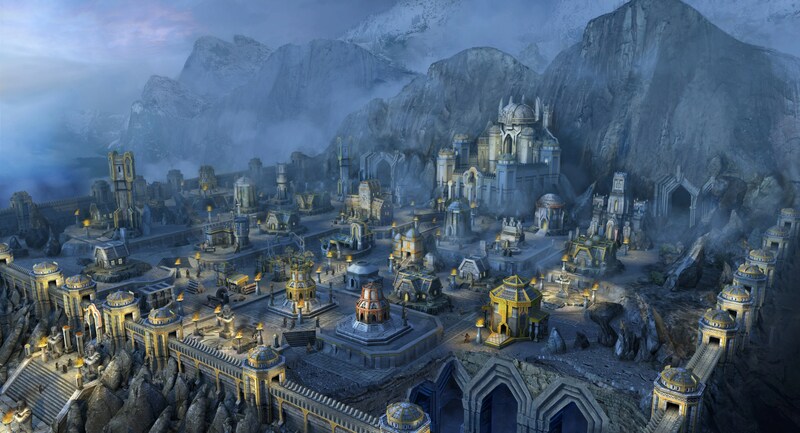 :” In Bazran Hai, capital of the Zedu kingdom, Jung-Mo talked with Desc Soo-Ann, or Desan, a fellow Nannuattan Ninja from the Gokuri Empire. He also fought four Kobolds in an ambush alongside Ember and Tokoro. Meanwhile, Sonny, Toshi, and Soske’ secured the “Dragon’s Beard” inn and divided party treasure, while Saigo Kasugi had a romantic rendezvous with Princess Nayoko before resuming the search for his grandfather, Gen. Shinso Saigo. Saigo asks Wu Jen Toshi and Shukenja Soske’ for help wording a Limited Wish that he would use from an enchanted ring. The Samurai hopes to retrieve Gen. Shinso unharmed from wherever he is being held. Sonny notes that evenTeleport spells can be traced or reversed. Jung-Mo informs the rest of the group about his recent encounters and warns everyone to be on guard because two Kobolds got away and are presumably reporting to other Ninjas from the Shadow’s Claw clan. Tokoro and Ember consider getting and improving magical bows or arrows. The Hengeyokai Hulinyuan and Wu also keep watch outside and check on Jung-Mo’syoung wyvern and Toshi’s tiger companion Amaya. Jung-Mo and Saigo interrogate Wah-Ree (“Larry”), a Kobold captured in the alley ambush. At Saigo’s recommendation, the Nannuattan disguises himself as a female Spirit Folk. Sonny and Toshi listen from just outside the makeshift cell. Saigo gives the doglike reptilian humanoid some food and water. He thanks Wah-Ree for “helping to rescue his sister from some Nezumi” [ratkin]. The Kobold explains that the Shadow’s Claw clan hopes to redeem itself with Queen Kagejusko by hunting down traitors to Gokuri. Wah-Ree says that he himself is dishonored by being captured. The spy also says that wily troublemaker Desan has used his cover identity as a courier to get access to Zedu’s royal court. In return for the information, Saigo agrees to pay for Wah-Ree to leave the city. Jung-Mo says that his fellow Ninjas are likely working to undermine the leadership of Bazran Hai, and Sonny speculates that Gokuri emissary Lady Yun Aei-Yong might be in danger from her compatriots because of her truce mission. Meanwhile, Tokoro notices someone loitering outside the rented inn, and he quietly follows the cloaked figure as the adventuring party escorts Wah-Ree to the docks. Ember stays behind to watch the wyvern, and Toshi continues his arcane research on creating items for his companions. Saigo and Jung-Mo book passage for Wah-Ree on a boat headed south toward Sogewa. Shengtese humans Sonny and Soske’ keep watch, and Tokoro follows the suspicious tinkerer, who releases a pigeon from a wicker basket at the docks. The quick-thinking Ranger looses some arrows, dropping the bird. Sonny works his way through the crowd to retrieve it before a stray dog does. The Kensai finds that the dove’s talons have been sharpened and coated in poison. Tokoro continues following the would-be assassin and sends Mala, his otter companion, to fetch the others as he heads toward a lower tier of Bazran Hai. The carp Hengeyokai realizes that his quarry has shrunk to blend in with the Korobokuru (eastern Dwarves) in the subterranean city. Tokoro shadows the tinkerer to a silversmith’s shop, as Saigo, Soske, Sonny, and Jung-Mo catch up. Saigo and Jung-Mo enter the shop, while Sonny and Tokoro circle around to the back. Soske’ keeps an eye on the front door. The tinkerer talks with a Korobokuru craftsman and heads to the back of the shop. She throws a smoke grenade in an attempt to evade Sonny and Tokoro. Sonny strikes her with his flail, and Tokoro casts Abundant Ammunition and readies his Merciful bow. The others arrive and encircle the tinkerer. Jung-Mo misses with darts from his blowgun, but Soske’s Remorse spell causes the mysterious woman to confess that she didn’t want to harm the pigeon. Saigo ends the tinkerer’s flight by knocking her out with his sheathed katana. Back at the Dragon’s Beard, Jung-Mo recognizes the latest prisoner as Oh Ok-Sun, a former lover! He checks her for suicide capsules, and the Nannuattan says that he is a defector who left Gokuri with a wyvern egg and without their master’s permission. She apparently knows nothing about the Scarlet Order, which has been sowing chaos in Tong Sheng. 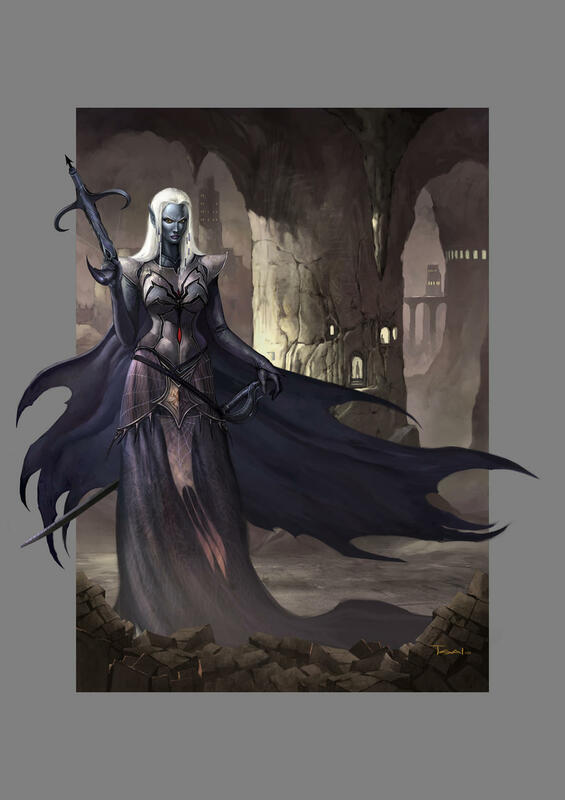 Jung-Mo promises to return to the Underdark once he has found a way to restore their clan’s name and defend his own. Oh Ok-Sun retorts that he’ll have to take his chances, and Jung-Mo offers to release her in return for noninterference. Saigo objects, saying that while he trusts Jung-Mo, he’s the exception among Nannuattan Ninjas. 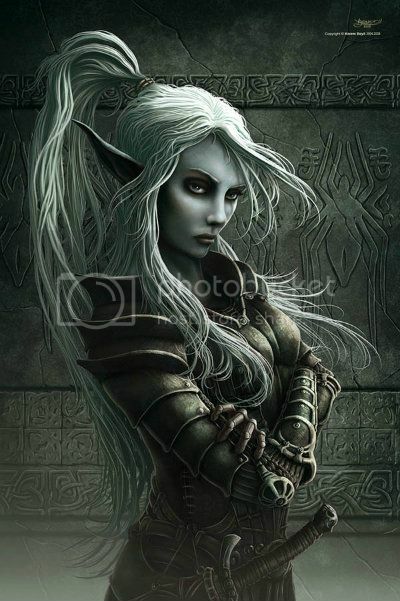 The Bamboo Spirit Folk (eastern Sylvan Elf) would prefer to execute the latest prisoner, but Soske’s Sense Elements (psychometry) on her weapons says that she is efficient and ruthless but honorable. Sonny and Toshi agree that the group should keep her weapons, with the exception of a nonmagical sword. Saigo and Ember still don’t trust Oh Ok-Sun, but Jung-Mo sends her away. Toshi says that he’ll need about a month to prepare enchanted items for his companions, such as a stealth suit for Jung-Mo, Crimson Moth silk armor for Sonny, a Scout’s Headband for Soske’, and improved armor and sword for Saigo. Tokoro considers Lesser Bracers of Archery. In the meantime, the Wu Jen meditates, and Soske’ prepares a divination to aid Saigo in finding his kidnapped grandfather. Scouts Jung-Mo and Tokoro make sure that Oh Ok-Sun leaves the area and resume watch over the inn. Several days pass, and Toshi aids Saigo with the wording of his Limited Wish. Ember continues to help Jung-Mo care for the wyvern hatchling. Soske’ contacts Zao Kasugi, a scribe and ancestor of Saigo. The Shukenja learns that Gen. Shinso’s location is magically hidden, but Zao may be able to locate him with help from sacrifices at the ancestral shrine and the temple of Yen Yuang, the sleeping god. The travelers go to Saigo’s family compound in Bazran Hai. The Bamboo Spirit Folk offers prayers and incense at the shrine and then takes the group to the relatively unadorned temple of Yen Yuang, deity of judgment and death. 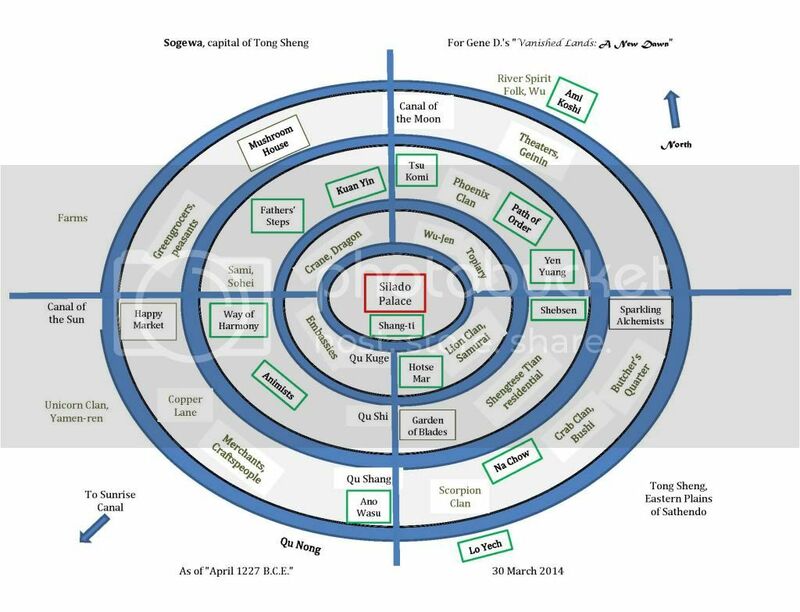 He briefly considers sacrificing rogue Gen. Wang Tung’s (+2) katana of Wounding. Hirohata Kotaro, a white-robed priest, leads the supplicants to a private area. Soske’ begins with prayers, and Saigo writes a vow that he won’t touch another woman besides Princess Nayoko for two years. The knight errant hopes to marry her but believes that she is above his station. He puts the scroll on an altar. All present see themselves in the heavens surrounded by clouds, who answer in the voices of Saigo’s ancestors. They approve of his quest and courtship of the princess. Meanwhile, Tokoro has a vision of the slumbering god, who holds scales and a quill. His finger twitches, and the Ranger sees the symbol for “citadel,” meaning that Gen. Shinso is likely being held somewhere beneath Bazran Hai’s palace! Saigo and friends find themselves back in the temple chamber, and Tokoro tells them about the clue from Yen Yuang. The scroll with the Samurai vow has disappeared. Sonny says that it would be nice to know more about who is holding Gen. Shinso. Sonny and Saigo help with the expenses for making permanent Soske’sForbiddance spell, which protects one large room in the family compound from planar travel and summoned monsters. Toshi readies Arcane Sight, Break Enchantment, Dimensional Anchor, and a scroll of Circle of Protection From Evil. Saigo’s grandfather appears in armor but unarmed and unharmed! However, because of the phrase, “of the same mind, temperament and moral code as he was prior to his capture — without the knowledge of his enemies,” Gen. Shinso has no memories of his months-long imprisonment. Saigo and Gen. Hirokazu Saigo are happy to be reunited with the general, who explains that he was on a covert mission for Daimyo Hei Wan Ling on the northern frontier. Shinso says that while looking for foes within the Zedu kingdom, he was ambushed in the woods north of Hei Kuan. Unfortunately, Gen. Shinso is unable to identify his attackers, but he also mentions that while traveling through the Dragon Pass in the Bamor Mountains, he saw a huge reddish dragon whose very touch corrupted the landscape. Soske’, Saigo, and Ember believe that the dragon could be a source of thegrowing chaos and a leader of the unnatural Scarlet Order. Sonny and Toshi agree that it would be good to take the fight to the enemy, who is possibly from the Red Wastes to the northeast, while Jung-Mo and Tokoro are more cautious. The wanderers debate on when to leave Bazran Hai. Still concerned about more Ninjas, archers Jung-Mo and Tokoro take up watch around Saigo’s manor. Kensai Sonny asks them to pay close attention to comings and goings in the demihuman neighborhood. Wizard Toshi resumes his enchantments, and shaman Soske’ rests after the rituals. Saigo catches up with his family and Princess Nayoko, and Ember returns to the wyvern at the Dragon’s Beard. After a few days, Jung-Mo and Tokoro notice that Shijo Yoshifumi, a master landscaper, doesn’t enter the family gardens but sends underlings while waiting out in the street. Saigo concurs that this is odd behavior. Tokoro sends his river otter Mala to dig up Saigo’s garden. When a servant notifies Shijo, the landscaper angrily dismisses him and leaves to supposedly get more helpers. Saigo and company stealthily follow him. Shijo pays little heed to other pedestrians, bumping into them as he heads to a lower tier of the city. Sonny asks Toshi to shift into baza (small blackbird) form and follow. Soske’ notices that Shijo is looking down at the street, and Tokoro recognizes his snakelike pattern of walking. Shijo moves a heavy cover and jumps into the sewers. The party follows [see middle leftmost entry on map]. Hengeyokai Tokoro leads, followed by Shengtese human Soske, Bamboo Spirit Folk Saigo, Shan Sao Toshi, and human Sonny. Tokoro tracks Shijo around some corners, across bridges over raw sewage, and to a square chamber, where he is talking to two reptilian Yuan-ti Abominations! They see the hunters and draw weapons. Halfling Toshi casts Arc Lightning, badly injuring one of the scaled humanoids. 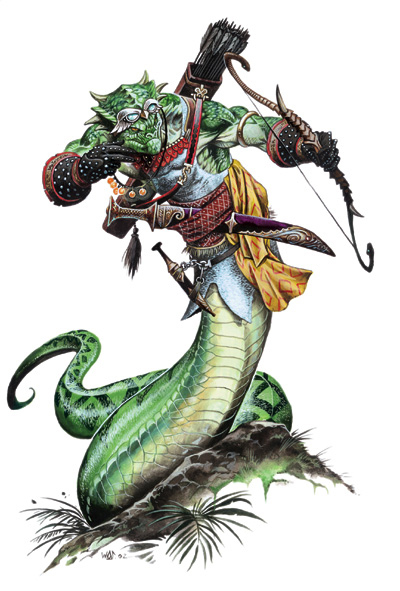 Shapeshifter Tokoro fires four arrows at the two Yuan-ti, and Soske’ petitions his ancestors for an Ice Bow. Saigo attacks Shijo with the No Dachi of the White Scorpion but misses. Chain master Sonny steps into the middle of the melee and swings his flail, hitting the enemy combatants. One Yuan-ti harms Soske’ with a glass, poison-filled arrow, and the other hits Saigo. Fortunately, the Samurai is able to resist the faux gardener’s Baleful Polymorph spell. Toshi casts Snake’s Swiftness, Mass, and Tokoro shoots more arrows at the serpent folk. Soske’ also shoots them, and Saigo hits Shijo and cleaves into the Yuan-ti. Sonny’s Whirlwind Attack fells the enemy archer, and the other one swings a dao (scimitar) at Saigo. While tying up Shijo, Tokoro realizes that he is also reptilian. 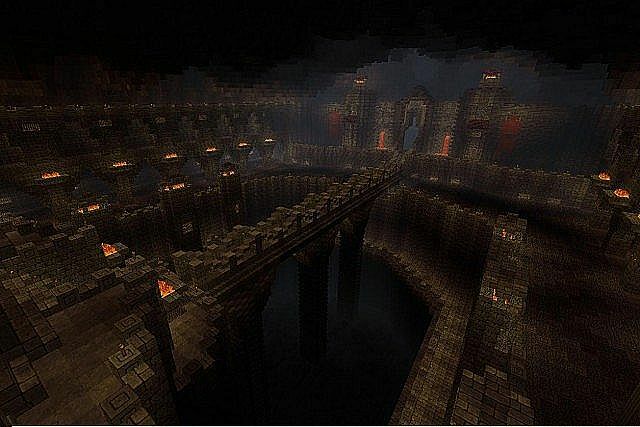 The spelunkers leave the sewers, and Toshi shifts back to bird form to get Jung-Mo and his carriage to transport their latest prisoner back to the Dragon’s Beard inn…. I hope that everybody enjoyed our latest “New Dawn” games. Sara and Josh, I hope that your honeymoon is going well, and we miss “Ember!” Let me know if you have any further questions about advancement and treasure. Note that we won’t be meeting next Sunday, Nov. 23, because I’ll be traveling, but I expect to resume on Nov. 30. I also look forward to seeing some of you at upcoming “Vanished Lands: Vistel’s Expedition” face-to-face sessions and the conclusion of Rich C.G.’s “Tunnel Vision” modern supernatural miniseries! 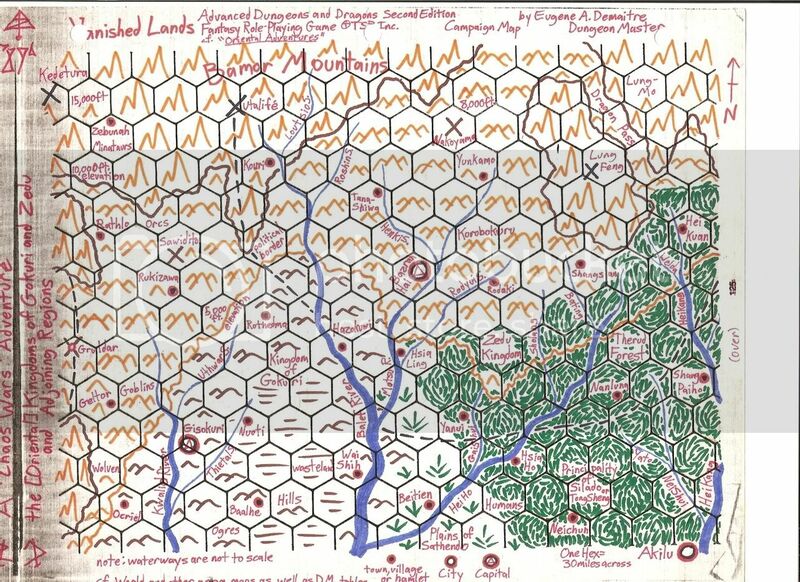 Posted on November 18, 2014 February 16, 2016 by GeneD5Posted in Fantasy & Steampunk, Games, Vanished LandsTagged A New Dawn, AD&D1, D&D3.0, D20, fate, Oriental Adventures, Party 40, pathfinder, retro-clone, telecom team, update.